I bought these denim shorts last summer and have loved them ever since! I'm not really anything but a dress wearer, but I'm always willing to throw these on. Since last year I've gained a lot of weight though and they're starting to get tighter :( :( Ugh, I need to loose just a bit of weight because I love these shorts too much to part with them! Oh, and I did end up skipping school today! Ahh, it was seriously so wonderful. I got a ton of work done and feel pretty satisfied. I am looking forward to going back tomorrow though; I sort of missed high school today! You look super cute! 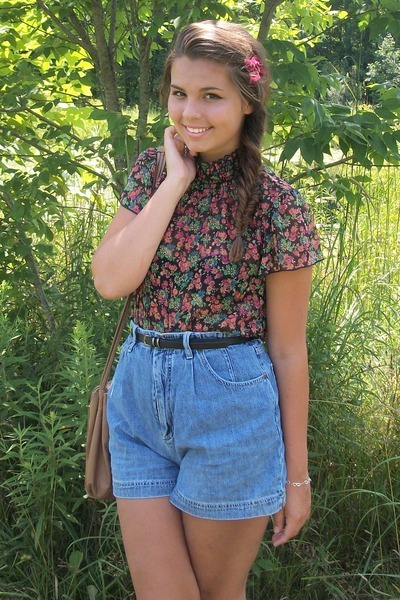 i wish i could pull of high waisted shorts! i love how you styled them! I love them with tights- I never thought I would like something like those again but I think they are cute on you! Your remixes are always great because there's always so much variety! let me just share this lingering thought: your hair looks ADORABLE in a braid. do it more! xo. You are so gorgeous. Don't look like you need to lose anything. Your legs look so stunning in all these pics(especially in the red tights) and those shorts are totally working for you. So adorable you are! My favourite outfit of yours in the one with the red tights!! I wish I had a longer toro, high-waisted shorts already long legs look too long!! I think you look fabulous. And I love how your not afraid to say you wear things more then once. Of course we do we are regular girls! Lovely. Passing Whimsies- Shop My Closet Store! Last Day of High School! If I Was From Paris.